‘If only the work of Marius de Leeuw will manage to escape from the wrecker’s ball, later generations will also get the chance to assess what the autonomous and applied arts could learn from each other.’ This is how an essay by Bob Smolders about Dutch artist Marius de Leeuw ends. After WW II painter and monumental designer Marius de Leeuw worked at many monumental commissions for hospitals, public buildings and churches in The Netherlands. In his style of half figuration, half abstraction he rendered religious scenes in concrete, paint, mosaics and stained glass. One of his largest and most well-known works is the Apocalypse window in the St. John’s Cathedral in ’s-Hertogenbosch. The stained-glass windows The Creation of the Earth and The Old and New Jerusalem which de Leeuw made in 1965 for the Carolus Chapel of the old hospital in ’s-Hertogenbosch are typical of his visual language. 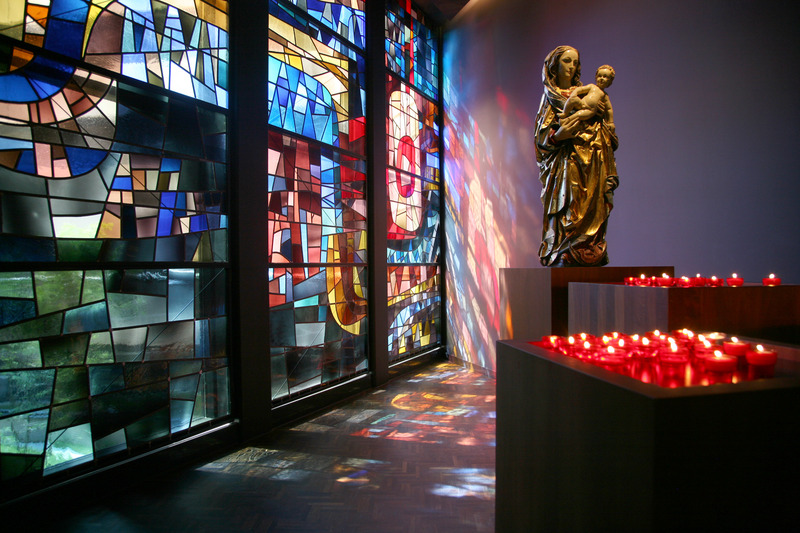 When the new Carolus Hospital was built, the old chapel was given a municipal function and the windows were installed in the Maria Regina Church in Boxtel. The decrease in parishioners, however, led to the closure and destruction of this church in 2002. The large window by Marius de Leeuw ended up at a demolition company. 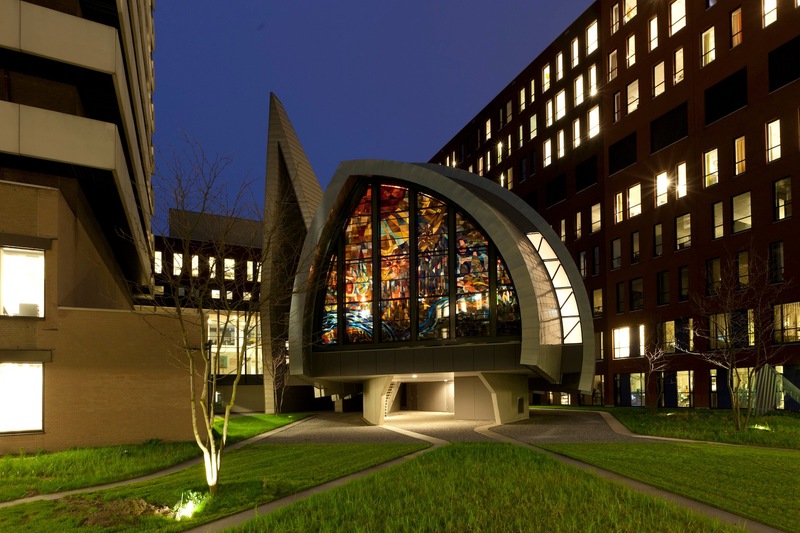 When the new Jeroen Bosch Hospital was built in ’s-Hertogenbosch in 2007-2011, the designers of the hospital wanted to include a new chapel. Finnish architect Johanna Kamunen and Dutch architect Bas Molenaar opted for a shape that stood out from the square forms of the hospital. The chapel is built on a rock as a reference to Peter, on whom the Church is founded (Matthew 16:18). The roof of the chapel consists of many scales that suggest the fish as a symbol of Christ. Next to the main body of the chapel a pointed tower rises up to heaven. By chance the stained-glass windows by Marius de Leeuw were discovered at a demolition firm, where they had been kept to be sold to pubs. The windows were bought for the chapel, but they had been disassembled in 180 panels and needed to be reconstructed. On the basis of old photographs the panels were put in their correct order. The question arose if it is justified to use a window from a much bigger church for a small chapel. And if so, which part should be used? Next the de Leeuw heirs were asked permission for reuse of the windows so that the designers could be granted the artistic freedom to make choices from the many subjects that were incorporated in the window. The scenes that were selected were The Creation of the Earth and The Old and New Jerusalem. The former consists of winding rivers with fishes, the sun and rays of sunlight, plants, flowers, rain, crystals and a city. The latter is made up of colourful, abstract forms. Whoever enters the chapel can go left or right to walk into the space of worship which is surrounded by a tall round wall symbolizing the embrace of believers. At the end of this space one sees the large window that portrays The Creation. The altar, pulpit and tabernacle are situated opposite to this window. The roof rises up in asymmetrical arches that push over each other like waves on a beach. Light enters the building through the thin strips of glass between these scales. To the right of the entrance one enters the St. Mary Chapel with the window about The Old and New Jerusalem. The purple coloured walls make the burning candles before the wooden statue of Mary light up even more. The stained glass sends out a warm glow. 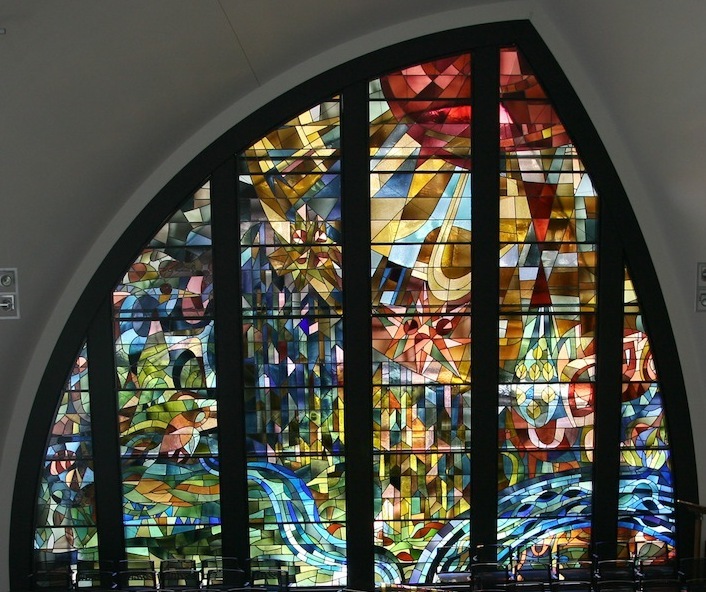 Marius de Leeuw: The Creation of the Earth and The Old and New Jerusalem, 1965, stained glass, the Chapel of the Jeroen Bosch Hospital in ’s-Hertogenbosch. 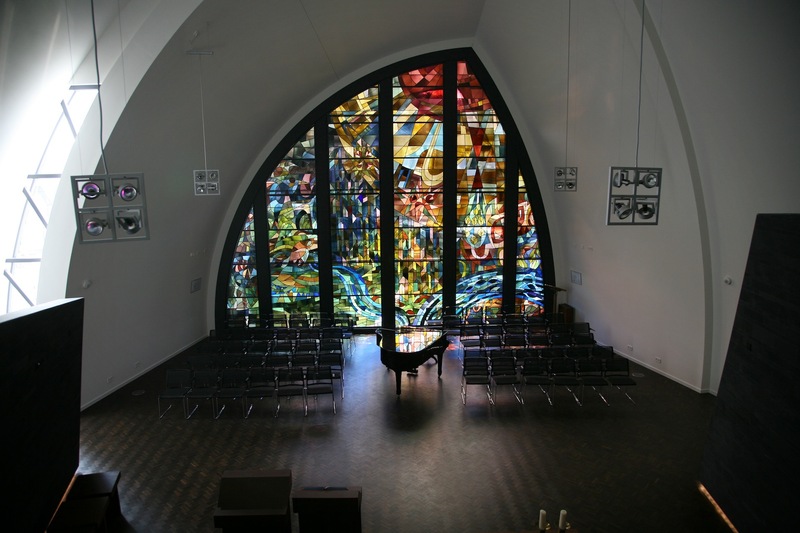 Marius de Leeuw ('s-Hertogenbosch 1915 – 2000) is known for his monumental stained-glass windows and wall paintings in various techniques. These can be found all over The Netherlands in churches and public buildings. Besides this de Leeuw made paintings, gouaches, drawings, watercolours and graphic work. He painted mainly human figures, still lifes and abstract works. De Leeuw received his training in 's-Hertogenbosch, Rotterdam and the Royal Academy in Amsterdam, where he was a student of Heinrich Campendonk (a noted member of an influential art movement of the 20th century, Der Blaue Reiter). From 1953 – 1980 de Leeuw worked at the Royal Academy of Art and Design in ’s-Hertogenbosch as teacher and adjunct director. Photos: 1, 3 and 4 were taken by Annuska Houtappels.